Bruce Miller shares history about the Westport Country Playhouse with Community Day visitors back stage on Saturday. Westport Country Playhouse threw open its doors Saturday, staging an open house for the public to get a behind-the-scenes look at the iconic theater's operations. 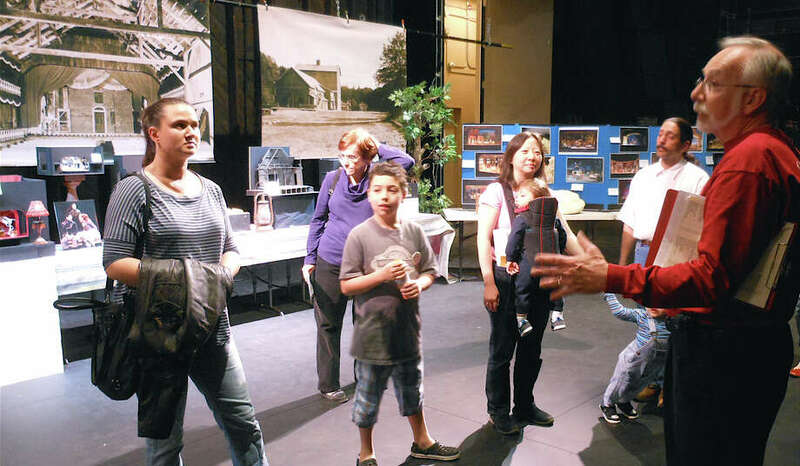 The third annual Playhouse Community Day attracted scores of theater enthusiasts who came to enjoy everything from creative crafts to guided backstage tours of the theater and stage area, dressing room, costume annex and set production area. "This is a chance for us to welcome people to the playhouse in anticipation of our new season start on May 1 with `Into the Woods,' " said David Byrd, the playhouse director of marketing. "Equally important, the day celebrates our community with participation by Earthplace, Westport/Weston Family Y, the Westport Public Library and Neighborhood Studios of Bridgeport, as well as seasonal restaurant partners like Da Pietro's and Rizzuto's." As visitors arrived, they were given a schedule of events and day map outlining the various attractions. In the courtyard, kids created hand puppets out of brown paper bags and performed skits in a miniature playhouse façade. Lisa Dahlstrom, watching her daughter Ainsley, 4, decorate her puppet, said, "I'm involved in community theater and I thought it would be fun for my daughter to experience this. "She's a little theater baby. She saw her first show when she was eight years old," she said. In the adjacent Sheffer Rehearsal Studio, several local restaurants, nonprofits and food producers had set up booths, and were sharing information and samples with visitors. On the porch near the playhouse entrance, Earthplace Executive Director John Horkel was introducing Zeke the Box Turtle to fans. Kids also could construct their own turtle from cardboard and paper. In the entry hall, there were food samples and literature displays, which visitors could check out as they were led to the theater, up on stage and to back rooms and spaces. In the costume room, Wardrobe Supervisor Lisa Ficco talked about how costume and makeup effects are facilitated while kids tried on hats and fake moustaches. "Kids love to see anything they can try on," she said. "They're startled by the quick changes and that things don't always appear to be what they seem. Adults are equally fascinated by where things are made and how productions are done. If people are excited to see theater, that's a positive and they'll get involved." On the stage, Bruce Miller shared some playhouse history. "We're excited to bring people in, especially families," he said. "Theater and imagination have always been partners. People see how we interpret the story." David Dreyfoos, the director of production, gave insights on set design, showing miniature set models and talking about all the moving parts involved in a show. "There's so much that goes into a production," he said. "There may be more crew working behind the scenes than actors on stage -- from spotlighting and costumes to props and more. I think people really gain an appreciation for the process." Anna Lopez, from Norwalk, was impressed. "I'm loving this," she said. "It's really fascinating to see how productions are done and all the hard work that goes into it. I'm very into interior design; I like the creative process and how thoughts are translated."